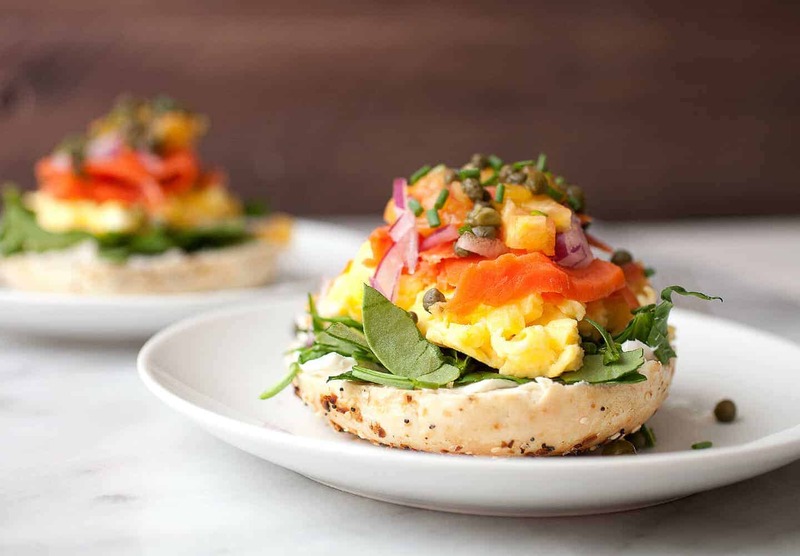 This big stack of delicious food started as a simple breakfast sandwich on a bagel. But it kind of kept growing. And growing. Eventually I had a hard time putting a top on the sandwich and an even tougher time actually eating it as a sandwich. So I figured I shouldn’t try to make a sandwich out of something that is clearly an open-faced situation. In case it isn’t obvious, I call this my Mile High Open-Faced Bagel because I made it for the first time in Denver so technically it was made at a mile high elevation. See what I did there? Okay, but seriously, it takes about 15 minutes to make this dude and it’s well worth every single minute. These stacked beauties are too big to sandwich! You have to just build them on half a bagel due to all the wonderful toppings. 1) Half bagel and toast it. Meanwhile, add butter to a small skillet over medium heat. 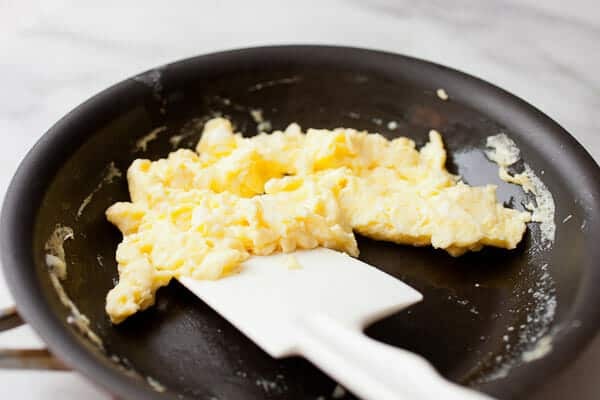 When melted, add scrambled eggs and let cook, stirring regularly, until they are just set. Be careful not to overcook them! 2) To build bagels, smear each half of a bagel with cream cheese. Don’t go too heavy on it. Top with spinach, scrambled eggs, and lox. Then add tomatoes, red onion, capers, and chives. Add as much as you want and pile it high! 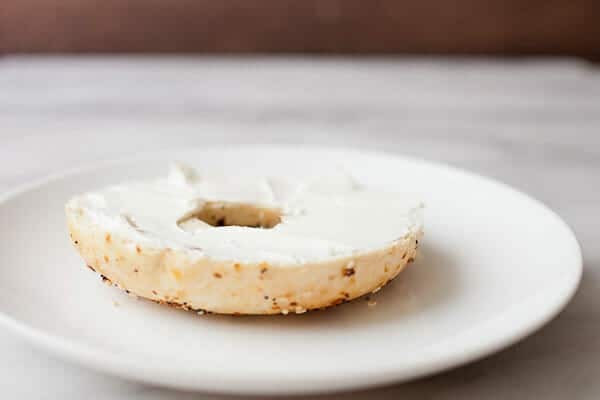 Half a bagel is a pretty good light breakfast or lunch given how big they are, especially if you serve it with some fruit or hash browns. 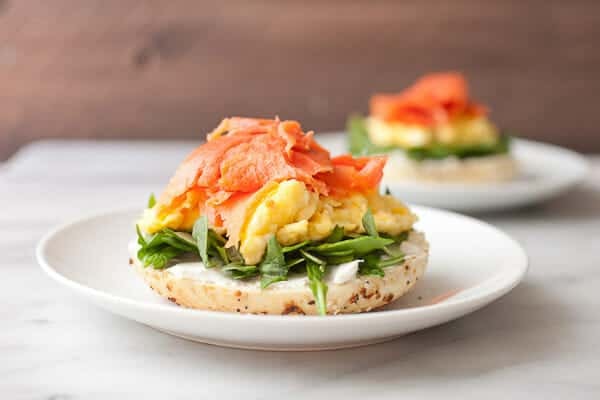 A good number of the toppings for this bagel is things you would find in a traditional lox bagel. Some tomatoes, good cured salmon, red onion, and capers. I also added some chopped spinach. The greens add some nice color and height to our bagel. Here’s the nicest thing about this sucker. Besides toasting the bagel (which you don’t even have to do if you’re on team Never-Toast-Bagels), the only thing you have to cook for this is some scrambled eggs. 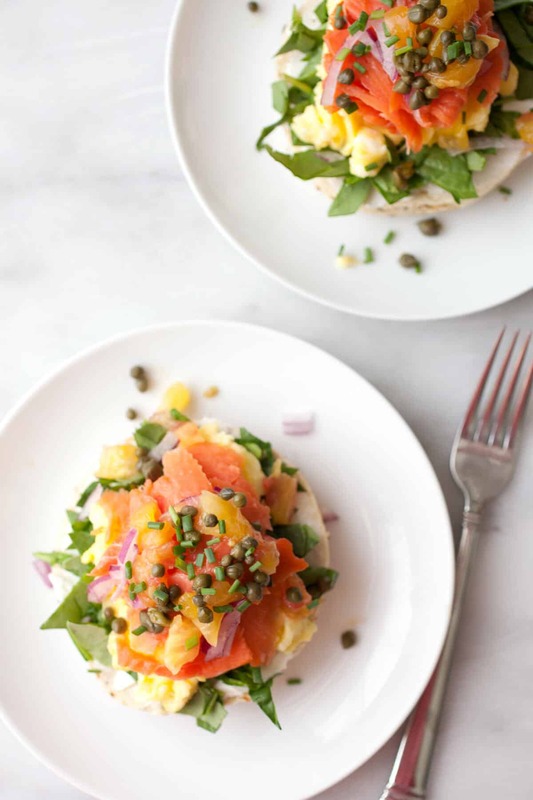 I think about one egg per open-faced bagel is a good amount. You could go higher obviously, but let’s not get too crazy. I cook my scrambled eggs over gentle heat with butter. Be sure to stop cooking them while they are still a bit undercooked. They will finish cooking in the pan off the heat and you don’t want to overcook the eggs! They should be soft and smooth eggs. Building the layers is pretty easy. I like a cream cheese base on my bagel, but don’t overdo it. Just a light schmear of cream cheese will do the trick. And while you can use any bagel, technically, I recommend an everything bagel or something with a good topping. 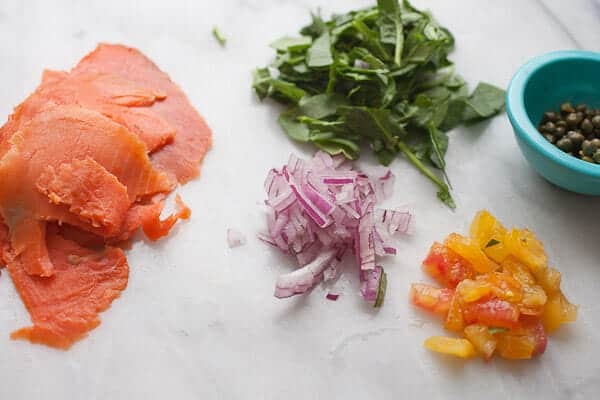 After the cream cheese, add the spinach, egg, and salmon in that order. The eggs won’t retain that much heat but they will warm up the spinach slightly which is nice. Again, you could go crazy on the salmon, but 1-2 oz. of lox is a great portion. Then some delicious and colorful toppings: capers, onion, tomato, chives, etc. I thought these were not only delicious, but beautiful! It would probably be $10-$12 at a fancy brunch joint. But, you can make this open-faced bagel without the mile high price! Nick, these are gorgeous! I especially like your addition of spinach and capers. And your scrambled eggs look perfect — I find most people either undercook them or overcook them. I’d rather have over- than under-, but just right is the very best! Beautiful! And they look delicious. Love the capers – I’ve never done that, but I’m guessing it adds a nice tang. Nicely done, as always!